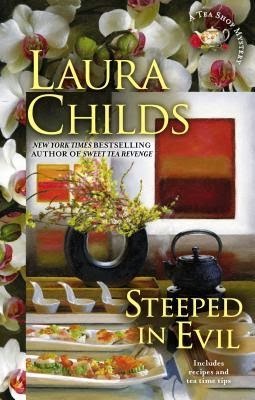 Thanks to author Laura Childs, I have two copies of Steeped in Evil to giveaway. 1) You must fill out the rafflecopter form below. 4) For an one extra entry: Tweet about this giveaway. 5) For an one extra entry: Leave a comment for the author. The giveaway begins on March 8th (midnight est) and ends on March 15th (midnight est). The winners will be chosen randomly by Rafflecopter. The winners will be notified by email and has 48 hours to respond, otherwise a new winner will be chosen. I will announce the winner here on my blog. A Tea Shop owner and a wine tasting....how cool. We have a small winery just a few miles from me. Sounds like a great idea for a series. These cozies with southern settings I find just captivating and fun. I love this series and have some catching up to do, this sounds like a great read. Thanks for the chance to win. I look forward to reading the latest in this series. I've never read a tea cozy (*lol*) before. TBR'd on GoodReads. love, love, LOVE this series!! I'd love to start reading this series! It sounds really good! Love to read this book! (fingers-crossed) that I win! I've had this series on my need to read list. Thanks for the giveaway. This looks like a great book! I love this series, but got seriously behind a few years back. I need to catch up! It sounds like a very fun and interesting mystery. I love the storyline. Thanks for having the giveaway. Love this series!! Can't wait to read the next one! Love this series! Can't wait to read the latest one& maybe win a copy in this giveaway. I love this series and have tried many new teas because of it! Thanks! One of favorite authors...i have to read it! I love these types of book -- so many here I want to read (and win).